Okay, this reality keeps getting weirder and weirder and I keep hoping that somehow, it’s a simulation and I’m going to wake up a well-adjusted 12-year-old wearing a headset in a better world. 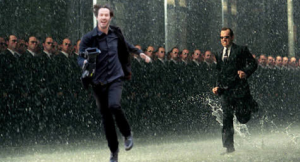 For now, though, we have Keanu memes like this one. A bit of background into my process: I often schedule and prepare stuff long in advance. So a good month ago, I was planning on analyzing Witchfinder General, which seems so oddly appropriate given the week that the U.S. has seen. Although, in fairness, this country is living through a massive upheaval that is ripping apart families, friendships and employment opportunities, so it’s a bit like opening a new cereal box every day to see what fresh hell awaits. To sort of balance that out, I paired it with Mindhorn, because, well, Julian Barratt. We’ll also have trailers and a short – due to some personal committments last week, we lacked in the trailer and short department, but we’ll be back again this week. I promise.